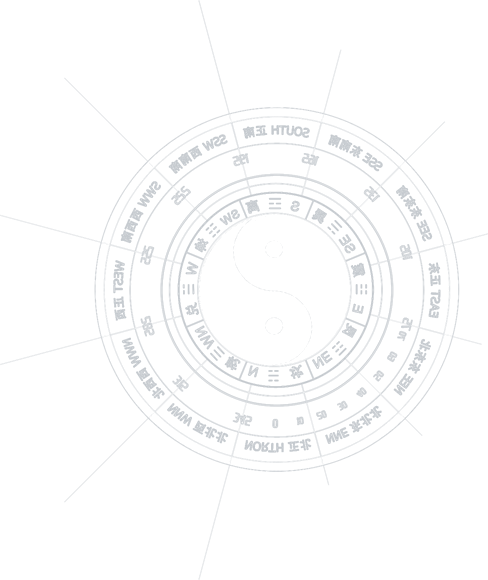 Your Zi Wei chart is built on the principles of Science, while decoding your chart requires the skills of Art. It is the combination of these two elements that makes a Zi Wei chart interpretation unique and accurate. 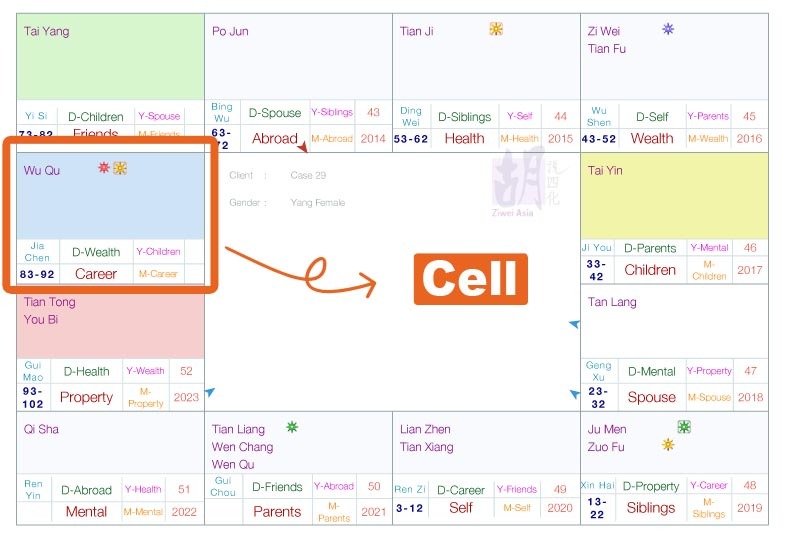 Cell is one of the most significant features in a Ziwei chart. It has a name. On the above illustration, the name of that highlighted cell is Career (Career). Basically, this particular cell will tell you about your career achievement, career focus, career changes, promotions, which career suits you, academic pursuit etc. It will sum up your whole career story for the entire lifetime. Therefore, this Career name stays permanently with the box regardless how many times you plot the chart as long as the same birth information is being used. 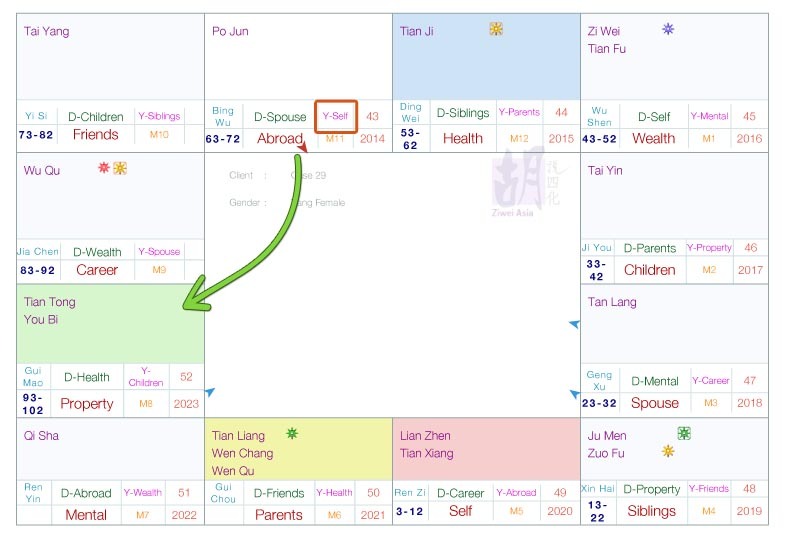 Since every Zi Wei chart is unique and customized to each individual's birth information, it is very highly likely that you will see your Career cell sits on a box different from the above. Every Ziwei chart conceals millions of destiny information. It is this information that explains what you experience in your day-to-day life. It starts from your first and all the way through to your last breath. Your destiny is unique and special, therefore it is almost impossible to find another duplication within your circle of close friends. This page is specially written as an eye-opener about Ziwei interpretation and analysis. As a beginner guide, its aim is also to introduce you to this Zi Wei Dou Shu legacy that was founded in ancient China about a thousand year ago. Read here: What is Zi Wei Dou Shu? This page will cover the explanations for Self Sihua (自化), Inherited Sihua (生年四化), Outflow Sihua (流出四化), Flying Sihua (飞星四化) and finally, Revolving Dimensions (流运). Sihua is a loan word. Directly borrowed from the Chinese pronunciation, it literally means "four transformations" i.e. Hua Lu (化祿), Hua Quan (化权), Hua Ke (化科) and Hua Ji (化忌). Generally, this brings about "abundance" or "easy access" to the Cell where the Self Hua Lu shines on. The owner is friendly, easy-going or positive-minded (Tips: For Self cell, it is also necessary to read alongside the star characteristic of the star that emits Self Hua Lu). Self Hua Ji generally damages the Cell where it occupies. It will injure the connection between the Owner and the subject matter of that Cell. In Chinese classic, it literally means "losing something you haven't already owned". Self Hua Quan can sometimes confer authority while other times it can mean loneliness. For the same reason, quite often noticeably that people who have high command of authority will inevitably have to endure loneliness in life. In a ZWDS chart, Self Hua Quan is obviously more welcomed in the non-people Cells such as Wealth, Abroad, Career or Property. By having a Self Hua Quan say in Career cell, the chart owner will usually find success easily at work. He will probably have superiority to make important decisions or opportunity to lead a large team of direct reports. On the other hand, imagine if it is the Spouse cell that houses a Self Hua Quan, this will likely to mean that his/her spouse is a control freak or he/she will still find emptiness in the companionship even if they live together. Therefore, Quan is basically not welcomed to occupy Self, Siblings, Spouse, Children, Friends, Parents including Health and Mental. Regardless of how superior a Quan can be, the by-product of a Quan can also return very devastating downsides and outweighs its positives completely. A Quan can assemble negative effects such as power struggle, competition or rivalry. It is imperatively important to ensure that a Quan will not receive a bad incoming Flying Sihua that can alter the fate of the cell. This is what we sometimes come across where people wrestle for ranking at the expense of friendship or even family harmony. This Zi Wei sign is relatively less important for a beginner. It means fame or reputation. It only becomes particularly handy if it resides on the Career cell or on the career achievement line. Whether or not you realized it, language has an immense power. It can bridge the gap and bring the Zi Wei Dou Shu enthusiasts from every corner in the world closer together here. Together in this community, we all share this thousand-year old legacy and we continue to carry forward this heritage with a hope to inspire the future generations of many more thousand years to come. The translation is easier than you thought. It is not about how powerful your language can flourish a grammar, but it is all about your passion and your dedication to share this Zi Wei Dou Shu knowledge. If you find your language has not been translated on this page yet or you want to improve the existing translated language... Hurry, come join us as part of our translation team. Inherited Sihua is calculated based on one's Birth Year. Therefore they are also known as Birth Year Sihua (生年四化). Every Ziwei chart will show the same number of Inherited Sihuas. However the configuration may likely differ as the locations are calculated based on the owner's birth year. They function almost as much as how their cousins, Self Sihua do. In other words, an Inherited Hua Lu would produce an equivalent effect of what a Self Hua Lu would. Nevertheless, the impact of an Inherited Sihua is much longer lasting but fortunately enough, its damages is cancelable by an incoming Flying Sihua (more about Flying Sihua below). Outflow Sihua is the first Sihua technique you have learnt by far that involves another cell to form an interpretation. The unique feature about Outflow Sihua is that it connects directly with the opposite cell. In the above illustration, you can notice that there is one Outflow that connects the Spouse with the Career. This connection bonds the two cells to form a strong relationship between them. Because of this, the produced event will have a tendency to happen consistently at all times in that person's life or it may also turn out to be a major event that bears considerably significant scar or memory in the owner's life. There are many different techniques to interpret an Outflow. One of the easiest methods is by looking at its face value per se e.g. Self (命宫) ––> Abroad (迁移宫) signifies a person's likelihood to travel abroad frequently or will migrate at some point in life. At another level, the connection of an Outflow can also be interpreted alongside the Zodiac sign to give you a more stripped down nature of that event such as how it will happen or with whom the event will be unfolded. At an even more advanced level, there are other more senior techniques which can also help to uncover more connections and nail-down with more clarity. This would not be discussed here as the aim of this page is to keep the learning simple and crisp. What have you discovered in your Ziwei chart? ○ What can Zi Wei Dou Shu really tell you? Getting excited for your first fly yet? Flying Sihua is powerful. This is the core technique that sets Sihua Flying Stars (紫微斗数-四化飞星) apart from other schools of Zi Wei Dou Shu. It is dynamic, vibrant and full of animation. Because of these complexities, many self-taught enthusiasts struggle to put every sihua technique together upon coming to this point. This is the gateway that will leap you to another height if you can master this well. As the saying always goes, learning Sihua Flying Stars is tough at the beginning but it would get easy once you have cracked open the Sihua maze into digestible pieces. A fly is actually another form of Sihua connection between two cells. Unlike Outflow, this fly does not land on the opposite cell directly. It can land on any cell including onto its own where the fly is initiated, and if this happens, this will naturally become a Self Sihua. Each cell in your chart is capable of sending out four flies simultaneously and they can be landing on the same or different cells. The cell that sends out the fly is called "Trigger cell" (飞出宫) while any cell that receives an incoming fly is called "Receiver cell" (飞入宫). Why four flies? Obviously, this is the product of "Four Transformations", Sihua, remember? Hua Lu Fly (飞祿), Hua Quan Fly (飞权), Hua Ke Fly (飞科) and Hua Ji Fly (飞忌). On the Ziwei Asia's website, the Flying Stars chart is specifically designed with different colors representation to show you all the "Receivers" (飞入宫). To find out how this works, simply mouseover your cursor on the Spouse cell (Trigger) in your chart and you will immediately notice the pop-up of all Receivers in different colors. A Hua Lu fly (化祿) means "to give away, will give rise to, devoted to, feels like, connects to, marks the start of an event...". With this, you can deduce that this owner is destined with strong romance luck in life (Spouse flies a Hua Lu to Friends). A Hua Ji fly (化忌) means "mindful about, overly worrying about, marks the end of an event". Applying on the same example above, the Spouse sends a Hua Ji Fly to the Property cell. This may mean that the owner may have a likelihood of running into a 3-party relationship at some point in life. By now, you should appreciate that the whole fundamental premise of Zi Wei Dou Shu is all about just one single conviction: CONNECTION (缘). Read here for more: What can Zi Wei Dou Shu really tell you? For a beginner, Hua Quan and Hua Ke are relatively less important and it is wise to just stay focused with the Lu and Ji first as a start. As much as what you have learned so far, they are all decodings that focus on events that will happen at lifetime level. Of course, there are times we might want to zoom in to find out exactly when the event will take place. To do this, we will need to explore Zi Wei interpretation at lower dimension levels such as decade, year, month etc. On the above example, you can also notice that D-Wealth (Decade-Wealth), Y-Children (Year-Children) and M-Career (Month-Career) are all sharing a same box with the Career cell. By the names they suggest, each of these can tell you a story at different dimension levels. While the Decade will govern the Wealth aspects for that limited 10 year period, the Children for that specific year and that the Career matter is confined to that particular month only. Step 1: Find out where your Y-Self is. This cell will be your Trigger cell. Step 2: As you would have noticed with the above, the Sihua Fly sends a Hua Lu into the Property cell from the Trigger (Abroad). The correct way of decoding is simple. As the fly connects two cells together, you will read the event as D-Spouse ––> Property (Decade to Life). By applying the interpretation definition of a Fly Lu, that will form a conclusion that this owner will likely to be engaged in a triangle relationship. And this indeed happened in year 2014 for this owner (Notice that Year 2014 is shown at the bottom right corner of Abroad). Remember it was the same chart we said earlier that the owner has a possibility to attract triangle relationship? With this, the revolving dimension uncovers it with more specific detail such as when will it happen, how will it happen, with whom will it happen etc. How much detail can we read from an event? It sometimes also depends on the owner's own input. The more availability of the environmental variables such as zodiac sign, where the connection started etc will certainly help the interpretation to narrow down and to exclude other irrelevant variables. Confused yet? That's not an uncommon sign. Every beginner will go through this confusion stage before gaining confidence for a breakthrough to happen. It won't take you long before you can read your own future mysteries if you work hard enough. It is also worth noting that Zi Wei Dou Shu requires high precision on the birth information input. Any incorrect information will end you up with a chart that does not belong to you. This is especially true with regards to the border-line birth hour such as 5:01am or even 3:05pm. Although the minute difference seems immaterial here but it is significant enough to land you on a completely different chart. This topic has attracted a whole range of debates on how one should determine which birth hour to use. Don't you worry, you can read this Ziwei blog for more better understanding: Should we adjust our birth hour?